Free Comic Book Day is this Saturday 5 May! Also: Webcomics = no constraints of specific page counts. Sales will benefit The Hero Initiative. Spider-Man sings "I Still Haven't Found What I'm Swinging For"
Uncle Ben's ghost serenades "Beautiful May"
Doctor Octopus seduces Gwen Stacy with "Ock-Tongue Baby"
Webbed-up bank robbers lament "Sunday Sticky Sunday"
Peter Parker sings "I Will Wallow"
Flash Thompson pines for Betty Brant with "(She Moves In) Mysterio Ways"
Daredevil wishes for a place "Where The Streets Have No Crime"
Electro belts out "Fried (In The Name Of Love)"
Aunt May's doctor warns of yet another medical condition in "New Tears May"
Ben Reilly sings the sad song "Clone"
Congratulations to Blake Bell re: nine years of the Ditko Looked Up website! And a Photoshop challenge to redo this cover as Doctor Strange! Update: And Howard Hallis has taken the challenge! One of Neilalien's most highly anticipated books of the year. Written by Fred Van Lente ( Action Philosophers ). The deal with the devil to save comics/Marvel/DC with the DM was looking good back then. Neilalien wants to add the info shown here for Doctor Strange #66 to his Doc Historical Sales Numbers Page. Ever since Comics Should Be Good mentioned it recently, Neilalien's received a few requests for an old fave around the orbital HQ: the great house ad by Frank Miller for a Roger Stern and Miller run on Doctor Strange. The ad played in February 01981 Marvel issues (this scan taken from Doctor Strange #45). Stern/Miller was supposed to follow the Claremont/Colan run, but alas, Miller ended up being unavailable to work on Strange- but we got Marshall Rogers instead, nuff said. Clicking on the image above will deliver an embiggened one. "His harshest critics called him no more than a comic book philosopher". Hmmph. Nada on Amazon.com USA yet. September 02007, 616 pages (Marvel-616? ), collects Dr. 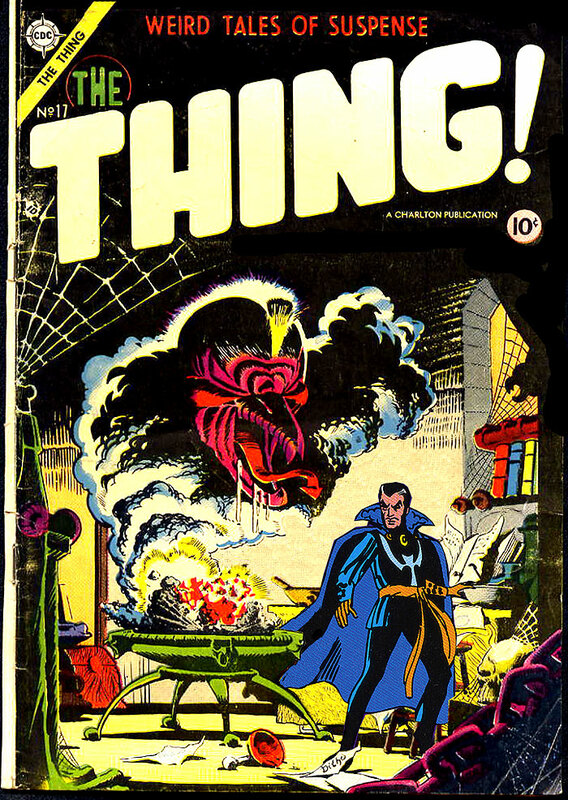 Strange #1-29, Annual #1 and Tomb of Dracula #44-45. Includes God figure Sise-Neg from Doctor Strange, and a funny Doc anecdote re: resurrection in comics. When Doc wore vests, two-layer cloaks, and muttonchops. Stopped by a cheesecake cover.